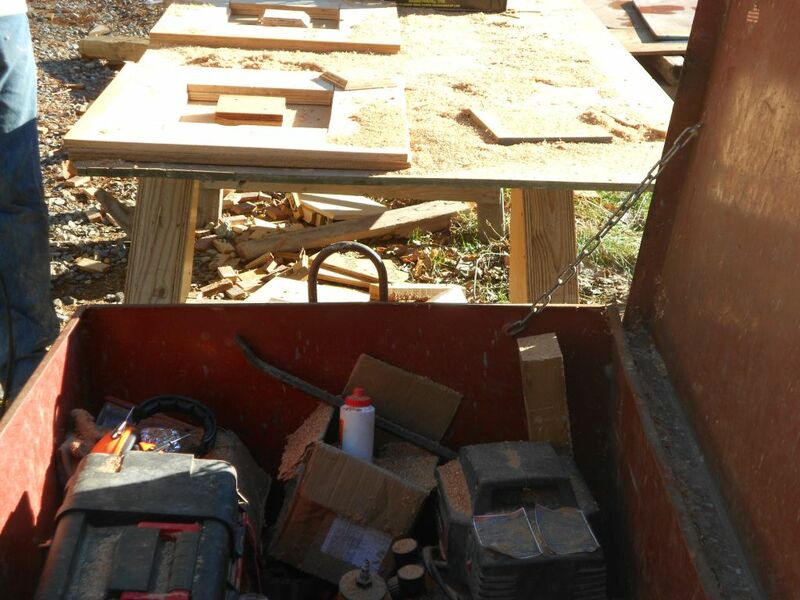 A Hobbit House takes Shape….Some New Faces…and Some Old. So I forgot to mention it but I got the Hobbit Hollow tee shirts in at the beginning of last week. They came out really well. 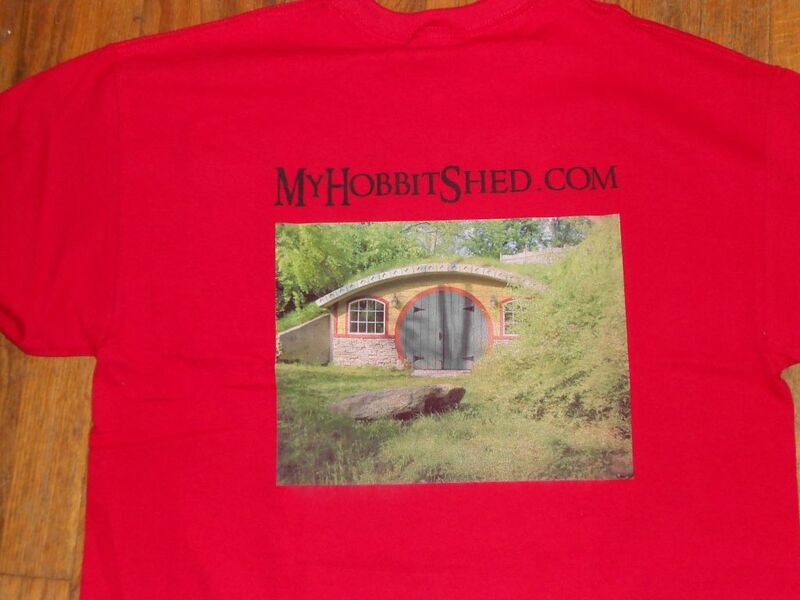 I have the company name on the front and a picture of the original hobbit shed I built on the back. I found a local guy who has a direct to garment printer. This is like the best way to do a digital photo on a tee shirt. The guy says the picture part will last as long as the tee shirt. (My wife had some tee shirts made last year from an online company and the image was an iron on. Within 6 to 12 washings these things were falling apart. It was so annoying….and she paid a lot of money for these tee shirts too!) Check out this shirt. Hobbit Hollow Company tee shirt. Pretty cool, huh? Apparently these are quite a hot item . I had a bunch made up to give to people who either helped me along the way or who physically worked at the site. Everyone wants to work at the site now. Everyone who works at the site is sworn to secrecy so the site is not discovered. As I tell everyone who asks, Hobbit Hollow is at an undisclosed location. Even the Great Eye of Sauron has yet to discover its whereabouts. As I said in the last post Terence and I set up for the final push last weekend. Of course it wasn’t enough setup so I got there early Saturday at 6:30 and got straight to work. It takes a while to get set up ….by the time I got all the tools out and set up the extension cords and all it was nearly 7. I wasn’t so sure how I was going to use the hired help so I wanted to get the middle row of roof templates installed right away. I was getting close to finishing when everybody showed up for our 8 o’clock start. Like I said before everyone wants to work on a Hobbit House. Well….almost everyone. So Jude brought his friend from school, Julia, who has been asking about the Hobbit house. Julia’s been to Appalachia to help build homes for the needy so she fit right in with the Hobbit Hollow crew and pretty much knew what I wanted and got right to it without a lot of explaining. ( Which was great by the way…thanks Julia!) Julia is a reader of the blog, unlike some of the members of my family, and she really wants to know more about Sally H. Sally H. lives at an undisclosed location as well. Morgoth knew about Sally H. but was unable to reach her because of the enchanted forests that surround her entire kingdom. Those who enter it fall under her spell…….and are never seen again…Gimli. Okay so I went on a bit of a rant. Let’s get back to work shall we? 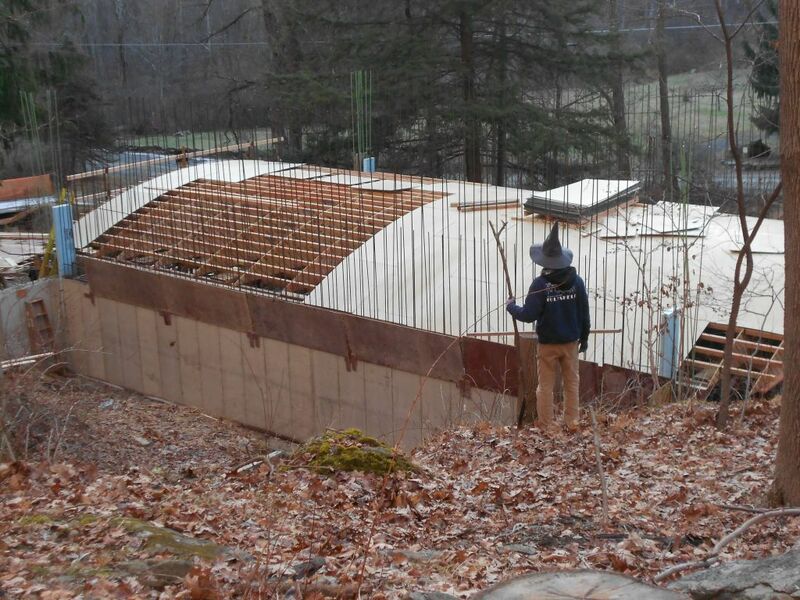 We had a light dusting of snow a few days back so I had Terence, Ethan and Julia clear the site before we got started. It was supposed to get into the 40s during the day and I didn’t want that thaw freeze thing to happen and make matters worse later on. Jude and Kevin continued where they left off closing up the top of the west wall. Here they are getting close to the end. Kevin and Jude closing up the west wall. I had Terence and Ethan square up the deck as best they could. It was pretty rough going though. After we cleared the snow there was that thaw freeze ice under the snow. They had to work pretty carefully. Most of the time sitting and sliding down the curvature of the roof. Here they are getting it done. 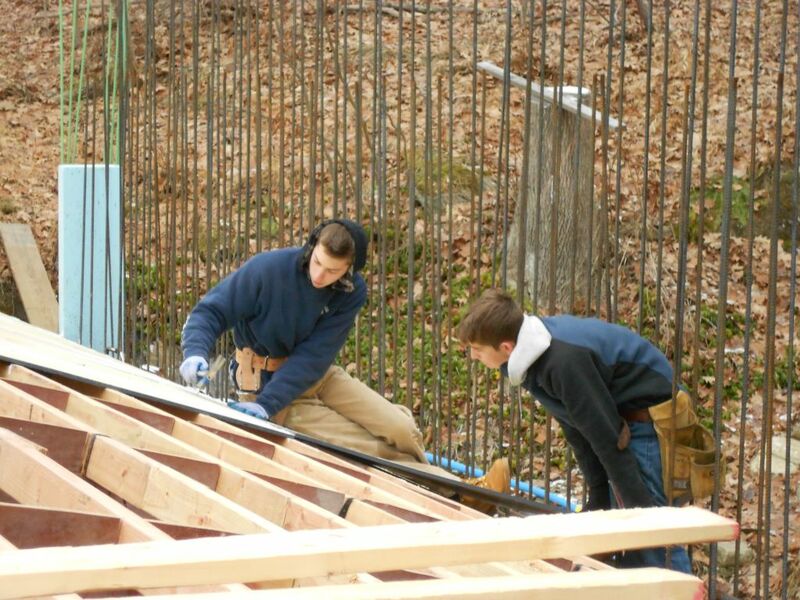 Ethan and Terence “The Good” nailing plywood. Julia I set up on the chopsaw. The final set of 2x4s we needed to cut to fit. I wanted to be able to walk across the planks at the front of the house so we needed to cut about 8 inches or so off the 12 foot 2x4s. I started to show her how to use the chop saw but I could tell this girl had done this before. I knew Julia would be going home with all of her fingers. Some of the other crew members, on the other hand….well….they did go home with all of their fingers too….but there were a couple of close calls though. Here’s Julia working away with choppy. Julia working the chop saw. So we’re cooking with gas now. I finished up the first set of templates and Julia finished cutting the 2x4s. She came up and started to install the 2xs and screw them together with the screw gun. ( She knew how to use that as well.) I continued finishing off the templates. While this was going on Jude and Kevin finished putting up the plywood on the west wall. What I wanted them to do next was put the top waler on the wall. This will hold the plywood in place and solidify the wall if you will. When we eventually do the rebar we will be able to climb and push off of the wall without the fear of messing up what they’ve done. And just for all of you keeping score the snap ties and waler system is used to hold the forms together when we pour the concrete. We’ll talk about that later on when we get closer to pouring. Here’s the waler they put on. 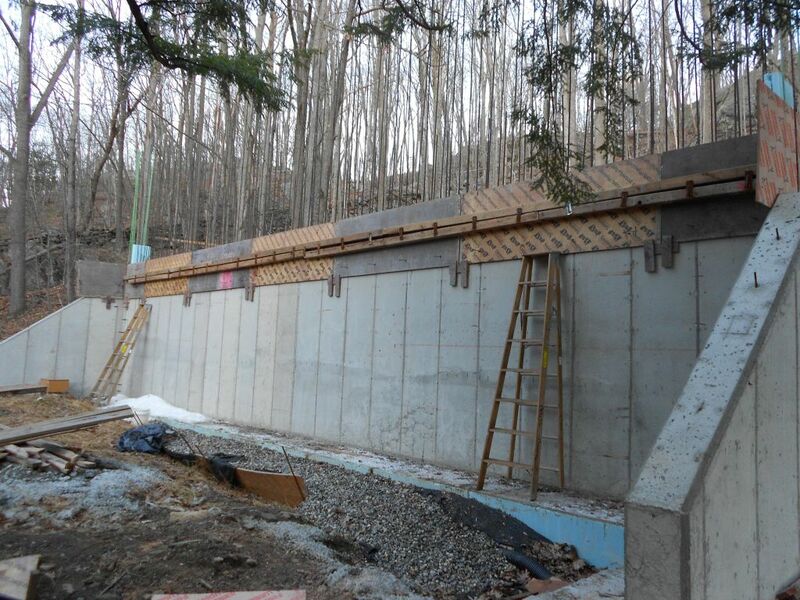 Top waler installed on West wall. Everyone was finishing their mornings work and it was about 11:30. I had Ethan take a lunch order and decided to set up Terence and Julia on the router table so we could get going on the detail blocks. 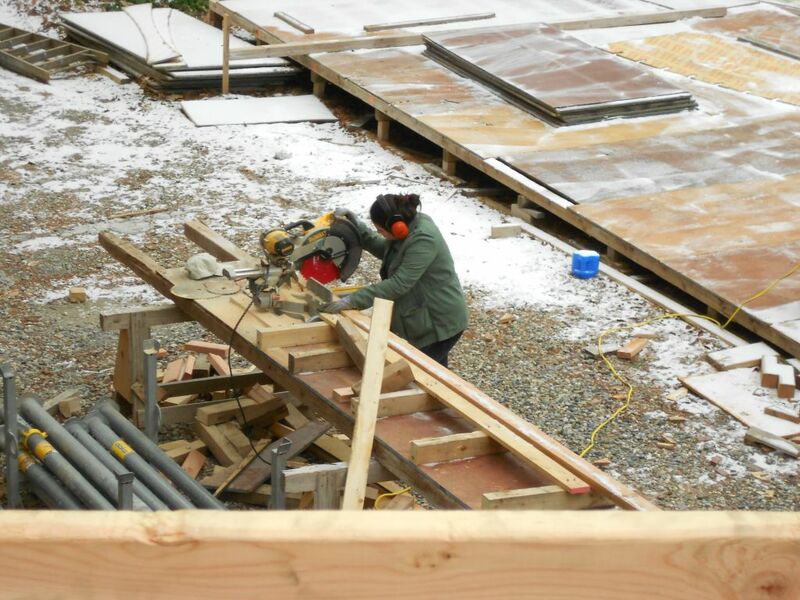 Originally I had thought we would finish nailing off the deck but I wasn’t ready to start. There really is a lot of little work to do before you can start. I set them up quickly and showed them how to do it. After I routed one detail block I’m thinking this isn’t such an ideal way to do this for these guys…and girls. So Terence says why don’t you set up the plywood around the whole thing….and that will make it easier, faster, and most of all safer. And so I did. The router is pretty heavy and you have to keep it flat on the material you are working on so I set up a support svstem that went all the way around the block that we were working on. Actually I set up two areas. One for the person using the router and another for a person using the screw gun. Each block has to be located in the right spot,screwed in, routed, screwed out and then a fresh block installed. Definitely a two person job. The only thing I didn’t have, which I thought I did, were dust masks for them. We’ll definitely be bringing them there next time. Here they are working away on the detail blocks. I think they did over 50 blocks by the end of the day! 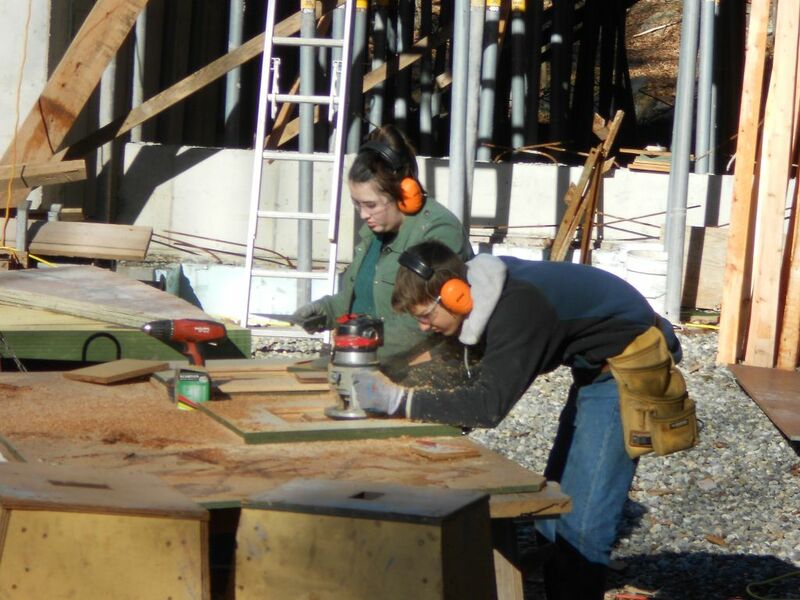 Terence and Julia working the router table. So what is it with kids today and food? Ethan gets back with lunch and I go finish up some work. I eventually sit down for my ham and cheese and I thought the crew didn’t have any sandwiches. It turns out they had already finished!! What’s up with that? I knew Jude ate fast. I mean he got a feed bag for Christmas. He doesn’t even look up during dinner….It’s only when he has to reload the feed bag that he actually talks or looks up. Hobbits love to eat….maybe they were figuring that if they had a quick lunch they would get another food break midway through the afternoon. That’s not happening. So the lunchtime conversation spiraled downward into a discussion of what is the purpose of things??? ?….Like mosquitoes and krill. Like I said it spiraled downward. Here they are in a light moment. T Kevin and Jude staring the east wall close up. Gang box covered with saw dust. Well it started to get late and I really wanted to get the first row of plywood down.I called Terence up and him and Ethan and I got it going.For some reason I forgot to take a picture at the end of the day. Which is unusual for me. We packed it all in and hit the road.It was only after I had gotten home that I realized I had left something at the site and I might as well take the camera and take a final picture if the light is still OK. So I’m driving up to the site and I can see through the trees as I’m getting closer that someone is on the property.I drive past Hobbit Hollow and park my car down the road.I figure I’ll sneak up on this guy and let him have it if he’s up to no good.So I get to the back of the house and the guy is just staring at the house. Like for a long time….and then he just leaves.Weird??? I did get a picture of him though.Check it out. The watcher in the woods? Gandalf? (maybe his robe is at the dry cleaners?) Naaaaa….. This thing is really taking shape, huh? Have a happy New Years Eve be safe and I wish you all the best in the coming New Year! Setting Up for the Finish…An Egg on a What!!!? 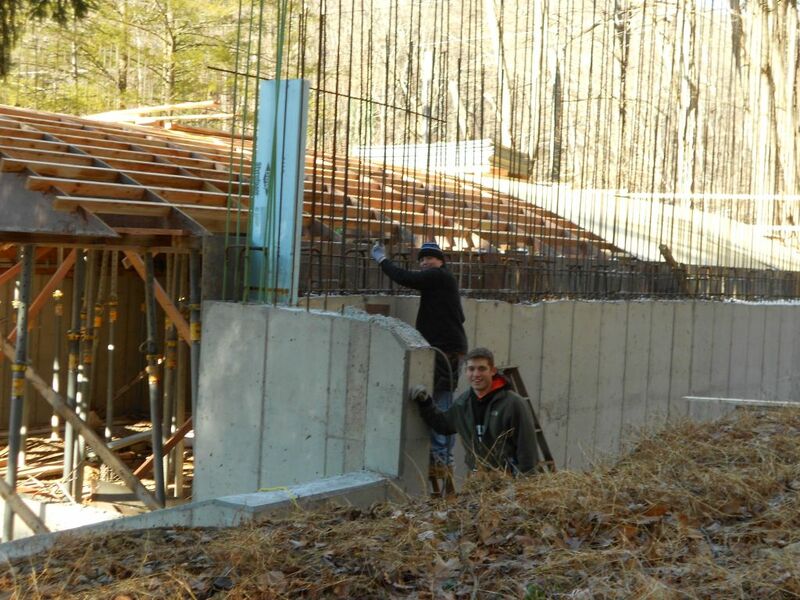 A Spandrel Takes Shape…The Desolation of Smaug Revisited. Happy New Year! I enjoy reading the blog and also ‘hearing’ your humor within the posts! Glad things are going well. Charlie Just (Shoprite) would be proud..
Mike : Glad to hear from you! Some of the funniest stuff I put into the blog my editor took out. She didn’t want me offending anyone. I guess that’s right. But some of the stuff was quite funny. (I put some good mobster stuff in one post.) Charlie Just would have chuckled I’m sure. I’ll talk to you soon,happy new year as well! At the risk of leading the flunkies from Mordor right to my door, I will tell you that I am Virginian, born an bred, and live in the south central part of the state, where the dirt is red, the people are friendly (and relatively diverse,) and history is not far away. We have a small self-sufficient based farm on 35 acres of mostly-wooded land. We have an old house (built not long after the late unpleasantness and added on to with great regularity ever since) which is inefficient in every way, so we are building another. The old one will not be torn down, but put to alternate use. I’d be happy to talk to Julia, and you are welcome to share my email address with her. ps. Krill were made to feed, well, everything — a huge number of sea creatures depend on them or what eats them — but I’m most thankful that they feed the baleen whales like the humpbacks. Mosquitoes feed bats, which are fascinating creatures as well. Ah Sally, I knew I could count on you to reply. You’re a Hobbit Hollow Construction blog favorite. Whenever you start that construction blog of yours we are going to have to give you a shout out and let everyone know what you’re doing. Good luck and best wishes in the coming new year!